Bake this fruity, spicy cardamom Cake! You could refer to it as ‘soul cake’ also in the sense that it gives such comfort. Especially when it’s cold outside, or stormy. In Holland we have this stormy weather often in late fall and early winter. It conjures up images of people on bikes, leaning forward, trying to peddle against the wind, dry leafs swirling, trees bowing, darkness when going to and coming from work. It’s the last weeks up to Christmas, when everybody finally can relax and enjoy! Or get stressed of course, by family obligations and not knowing what to cook, or by the horror of images of overcrowded shops and having to buy presents for people who have everything. Trust me, this cake is made to make you feel relaxed and content. It’s easy to make, wonderful smells will fill your house and, once out of the oven, this cake will warm you to the core. I have made this cake many times in different shapes and sizes. I used all or half of the recipes’ ingredients. I made one big cake but also 40 small ones, to better spread the joy at a neighborhood party. Everybody seems to like it. It’s spicy, fruity and the ‘secret’ ingredient, a hint of cardamom, gives it it’s final push into it’s memorable cake status. Not too much cardamom, that’s the trick, just enough to be present in the background, but it mustn’t overpower. You can also easily add more or different dried fruit. I would like to use some dried cherries but they are impossible to get around here. So I stick to dried apricots. I use organic ingredients for the most part. In my opinion it makes it even better in taste and texture. My other super ingredient is the liqueur from a small artisan distiller called Zuidam. They have a liqueur made from almonds (like amaretto) with speculaas spices which is divine. But you can use any liqueur you like of course. This concoction is an adaptation from a recipe I got from a friend, who got it from a friend. Next to inventing my own stuff, this is what I like best. These recipes are special because they have a story and a face that’s connected with them. It’s great to associate friends with food. I have a map full of recipe papers, some dating back several decades, some given to me a week ago. It’s like a treasure box. This is easy. Preheat the oven at 175°C / 350°F . Cut the dried fruit in little pieces and soak it in the liqueur for at least 30 minutes. Mix the butter and sugar well and add the eggs one by one. 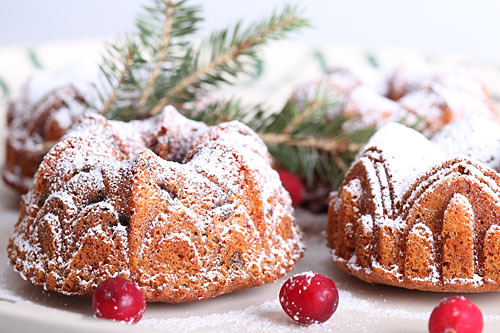 Mix in the other ingredients and put the mixture in a greased cake or bundt pan or mini bundt pans. And now for the slightly harder part: this cake takes a while to bake, so have some patience. If you make the big cake with all of the ingredients from the recipe it takes at least an hour to 70 minutes, depending on your oven. For a cake with half the ingredients (perfect for sharing with a few friends) it takes about 45 minutes. Just keep an eye on the process. Meanwhile your house is filled with warm and welcoming smells. And while the storm is raging around the house, you and your loved ones will be cozy and warm inside enjoying this cake with some hot cocoa (maybe some liqueur in it?!) by the fire. Thank you for the fantastic recipe. I have made it today and was a hit. its a keeper ;definitely . the tender buttery spicy melt in the mouth texture is heavenly. I have made a small adjustment where i reduced sugar to 150 g, added a bit of baking powder since i only have all purpose flour on hand, and soaked the dried fruits (mixed raisins in my case) with orange juice. Reduction of sugar was due to the sweetness of both orange and raisins . And end results was just perfectly sweet . Next time will try it with dried apricots and some orange zest perhaps , I feel it will complements the cake really well. We love reading your comment and we love this cake. We made all kinds of versions and its a recipe that allows endless variations (but almost always with the cardamom, because it smells so nice). So great our recipe brings you joy, hope the next version will be equally delicious. Wishing you many enjoyable moments baking and sharing! Wonderful recipe! It has quickly become one of my favorites and go-to recipe for cozy Sundays and visits from friends! Thanks Menno! Some years ago I made a big plate full of mini versions of this cake and distributed them when we gathered outside under the neighborhood Christmas tree. Somebody else had made mulled wine and hot cocoa. It was rather perfect.